Swiss bank UBS said Tuesday it is banning its private bankers from traveling overseas amid a tax evasion probe by the U.S. government. The global travel ban, which came into force April 1, applies to private bankers in the Wealth Management & Swiss Bank and Wealth Management U.S. divisions, the bank said. UBS, Switzerland’s largest bank, is in a legal battle with the U.S. officials over its unwillingness to divulge the names of American clients it helped to avoid paying U.S. taxes. Federal officials last month announced an agreement in which UBS admitted helping U.S. citizens evade taxes, and included for the first time the identity of some of those citizens. The Swiss and U.S. governments continue to disagree, however, on how many names should be provided to the Internal Revenue Service. Switzerland has long relied on its strict bank secrecy laws to attract customers from around the world. Last Friday, the first U.S. citizen to be charged with hiding IRS-taxable funds in a secret UBS account appeared in court. 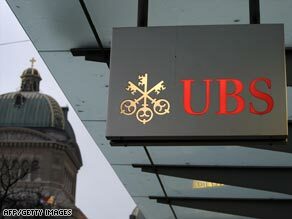 Federal prosecutors said the man, Michael Rubinstein of Boca Raton, Florida, controlled millions of dollars’ worth of assets in UBS accounts on which he had not paid taxes. Rubinstein was charged with filing a false income tax return for 2007. In announcing the travel ban, UBS said only that it is conducting a review of policy and compliance rules for its international wealth management business given the “international scope and complex regulatory environment” of that business. The travel ban will be in place pending the finalization of the review, UBS said.